Pandemic is one of our top co-op board games, so we decided to hold off on doing a Pandemic: The Cure review until we had a chance to take a break from the original game for a while. Well, we’ve now had a chance to play The Cure, so here’s the review! What is Pandemic: The Cure? In Pandemic: The Cure, players will try to cure four deadly diseases by rolling dice and using actions and abilities to wipe them out. The diseases can spread quickly, though, so it will be up to you and your team to correctly time treating and curing them before they get out of control! Pandemic: The Cure was designed by Matt Leacock and published by Z-Man Games. Before you start playing Pandemic: The Cure, everyone will get a character card, that character’s dice, and a matching pawn. You will also roll 12 random infection dice to see where the the initial problems are going to be. A turn consists of four parts, two of which are optional. You start your turn by rolling your unique set of dice (rerolling if you want to) and performing actions based on what you roll. Actions include traveling by boat to an adjacent location, flying to any location, treating diseases, and collecting disease samples. You can do your actions in any order. Everyone has one biohazard die face on their dice, which gets locked in when you roll it. When you roll a biohazard, you will increase the infection rate. Every four infections leads to an epidemic, which forces you to roll all dice in the Treatment Center (the center ring) as well the number of dice indicated on the infection rate tracker. This is how the game can get out of control! After you’ve completed your actions, you can optionally give disease samples to other players in your location. You will want to do this when the other player has a better chance to cure that disease. The third part of your turn is attempting to cure a disease, which is optional. Curing diseases requires that you roll all of the “disease sample” dice that you’ve saved and get a 13 or above. Nothing bad happens if you don’t reach 13, but those dice will still be unusable until you do cure that disease. The last thing that you’ll do on your turn is infect more regions. You will check the current infection rate, roll that many dice from the bag, and then place those dice in the appropriate places. If you roll any crosses during this phase, those go in the CDC and can be used to pay for event cards, which are all good things. There are three ways to lose and just one way to beat Pandemic: The Cure. You will lose if either the infection rate or the outbreak track ever reach the skull and crossbones, or if there aren’t enough dice remaining when you need to infect regions at the end of your turn. The only way to win is to cure all four of the diseases. Check out Pandemic: The Cure on Amazon! Easily our favorite thing about Pandemic: The Cure is how high the tension levels get once you’re about midway through the game. It is a very tough game and the randomness of the dice, which is sometimes a bad thing in other games, really ratchets up the tension. Unlike with the original Pandemic, setup is a breeze with The Cure. All you have to do is lay out the discs, get the character and event cards, and pull out some dice. While it’s not necessarily a “portable” version of Pandemic, it is a game that you can set up and play in less than 40 minutes. 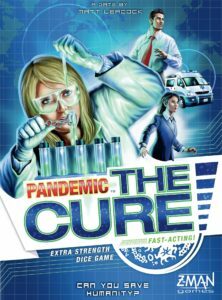 As is the case with all of the Pandemic games, the player aids in The Cure are excellent. These cards make it very easy to teach the game to new players and it’s just nice to have a reminder of turn order and actions you can take. We haven’t played The Cure too many times, but it’s pretty obvious that there is plenty of replay value here. The dice rolls are always going to lead to randomness, which is a good thing in this case, and you have plenty of characters to choose from to give yourself some interesting abilities each game. 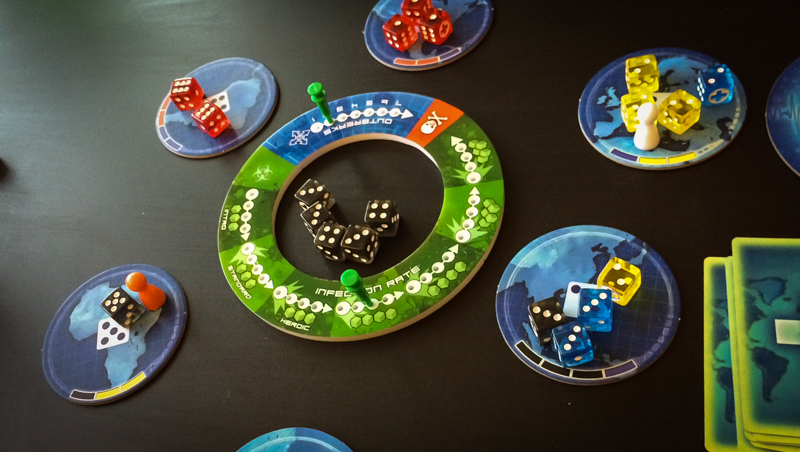 Without the board, Pandemic: The Cure doesn’t quite capture the theme like its big brother does. In the board game, you actually move to different places around the world, while in this one you are moving from one disc to another. The theme is there, but it’s just a bit lighter. The temptation to be an alpha gamer is much higher in this game than in the original Pandemic. Why? Because your dice are visible to everyone and some players might not be able to stop themselves from trying to “help.” In board game Pandemic, you can avoid some of this by holding your cards so no one else can see them. The original Pandemic is a classic and one of our favorite board games, so it shouldn’t come as too much of a surprise that we, as a group, don’t like Pandemic: The Cure quite as much. However, there are a few people who did actually like this one just as much as the original because they love dice rolling and how this really does have a similar feel to the original. So, who should get Pandemic: The Cure? If you’re a fan of dice rolling games and you want a great intro into this family of games, then The Cure might be perfect for you. If you’ve already played the original Pandemic, you’ll want to get this version if you prefer dice rolling and/or you want a shorter version of that game. On the overall, we think Pandemic: The Cure is an excellent dice version of Pandemic and a fantastic family game. Most of us still prefer to play the original, but we’ll still play this from time to time because it’s an intense, challenging co-op game… with dice! If you end up enjoying Pandemic: The Cure, you might want to check out the expansion, Experimental Meds. Thanks for taking the time to read our Pandemic: The Cure review!